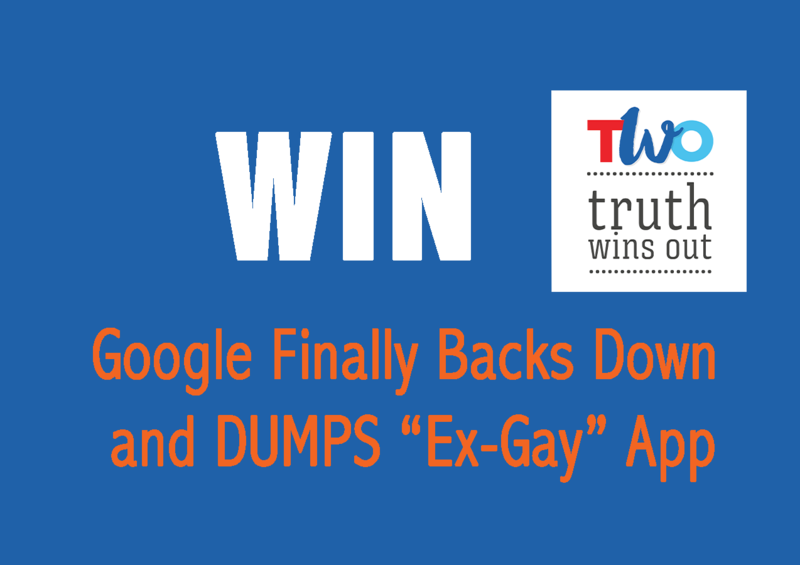 WASHINGTON – Truth Wins Out declared victory today after Google finally deleted a toxic “ex-gay” app from its online store that targeted LGBTQ youth. The move by Google to dump the app by Living Hope Ministries came after an intense four-month pressure campaign by TWO that included a Change.org petition that gathered more than 142,000 signatures and a push to elevate the voices of key lawmakers who demanded that Google act with corporate integrity and responsibility. The final straw was the Human Rights Campaign suspending Google from its Corporate Equality Index. Truth Wins Out originally targeted Apple on Dec. 20 2018 with a Change.org petition that urged the company pull the app. On Dec. 21, Truth Wins Out praised Apple for acting with corporate responsibility for deleting the app. Microsoft also acted with integrity and abandoned the app immediately without having to be pressured. On Dec. 27, TWO wrote a letter to the CEO’s of Amazon and Google urging them to follow the lead of Microsoft and Apple. On Dec. 28, TWO applauded Amazon for swiftly removing an app that clearly degraded and dehumanized the LGBT community. Google, however, dug in its heels and wouldn’t budge, nor would the corporation explain why it had made the unwise and insulting decision. Google would not even abandon the app after TWO pointed out that Living Hope Ministries was marketing its deeply homophobic poison to sixth graders. TWO told the moving stories of those who survived “ex-gay” programs, but even sharing these harrowing experiences didn’t inspire Google to act. We then helped elevate the voices of former “ex-gay” leaders — such as Randy Thomas, Yvette Cantu Schneider and John Smid (portrayed in the movie Boy Erased) — who now renounce these groups. They placed powerful and persuasive op-eds in a number of media outlets. New York State Sen. Brad Hoylman was a tremendous help, and we are deeply appreciative that he forcefully spoke out and demanded that Google take down the “ex-gay” app. We also thank Pennsylvania Rep. Brian Sims who released a strong statement and appeared on Facebook Live to hold Google accountable. Additionally, Milford, PA Mayor Sean Strub spoke out early and we thank him for his efforts. City Commissioners Geoff Kors, (D-Palm Springs-CA), Ryan Mellow (D-Tacoma, WA), Patty Sheehan (D-Orlando, FL) and Denise Simmons (D-Cambridge, MA); Mayor Sean Strub (D-Milford, PA); and Register of Wills Byron Macfarlane (D- Howard County, MD). It’s important to point out that Change.org was an invaluable partner in this campaign and we would not be here today to declare victory without their tremendous staff. TWO Campaign Manager Jon Bozeman also played a key role and deserves credit. Additionally, TWO applauds the Human Rights Campaign for coming up big down the stretch and leveraging its clout to push us over the finish line. HRC’s pivotal role continues HRC President Chad Griffin’s legacy of successful activism. The Trevor Project also deserves as shout out for its efforts to influence Google’s decision.